We have all been there. You pick out a color of paint for a room in your house thinking that it’s going to look great. After a few strokes, you notice the color is not quite what you thought it would be. That’s okay, you think. It will look better when it dries. So you spend the majority of your Saturday painting the entire room, but lo and behold – the finished product is not what you had envisioned. I found myself in this situation after painting my kitchen. What looked like a soothing, neutral beige color turned out to be akin to a shade of pasty human skin. I gave myself time to adapt to the color, but I could not accept it. I mustered up enough motivation to overcome my innate inertia and decided to repaint it this past weekend. The first time I painted the kitchen, I did it in stages over the course of a week. Each time I got the supplies and area ready, then started with putting tape down along all of the edges and around the cabinets. Next I cut in all the trim with a paintbrush, followed by a roller for the larger sections. Each painting session was concluded by cleaning the brushes, disposing of the unused paint, pulling up the tape, and putting away the ladder. It took about 4 sessions of 2 hours each to paint the entire kitchen for a total of 8 hours of work. This description of the painting process likely sounds familiar. Or maybe you’ve found ways to apply kaizen to streamline the work, as I did this past weekend. I’ll share what specific improvements were made and what the results where in both the time and financial savings. We’ll start by saying the estimated cycle time would have been 16 hours, including the first unsuccessful paint job. Let’s see how much I saved with a little continuous improvement. It started when I selected a color that I had used previously in a different room of the house. 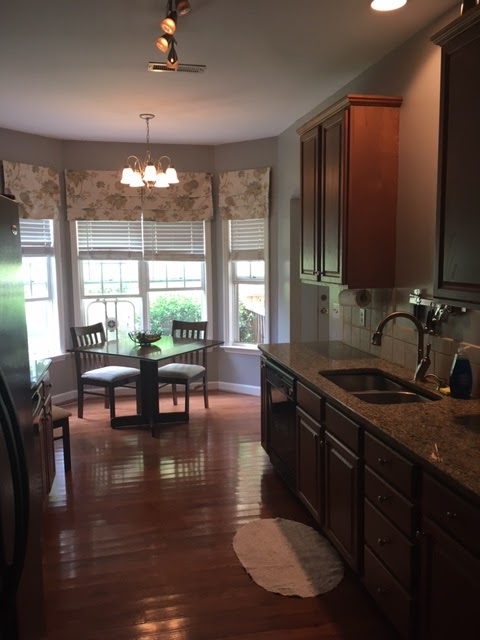 I knew that I loved the soft gray shade, and that it would complement the colors of my kitchen. This decision potentially saved me 8 hours of ‘rework’ due to not liking the final product – and a gallon of paint. Another option would have been to purchase a sample color and paint a smaller section of the kitchen to see if the color was acceptable prior to committing to it. It’s obvious that multiple setups and tear-downs are wasteful if they aren’t necessary. I decided to dedicate an entire day to starting and finishing the paint job. I estimate each setup to take 0.25 hours and tear-down to take 0.3 hours. By reducing the number of cycles from 4 to only 1, this is a time savings of 1.65 hours. There were benefits of the multiple cycles, though – for example, it gave me a chance to see how the paint dried in between sessions. However, I already knew that I would like the color as I had used it before. It’s common practice to lay down blue painter’s tape around the borders of the area to be painted to prevent painting other surfaces. However, a friend told me that if I used an angled, short handled paint brush, it was possible to paint cleanly without the aid of tape.With practice I learned the technique and only had to use tape in a couple of tricky spots. Even with the investment of time in learning the skill, I still saved about an hour in the process plus an additional 15 minutes of taking down the tape at the end. The special brush cost $2 more than a regular one, but I avoided spending $5 on a roll of tape, for a net savings of $3. Improvement #4: Implement ‘one-piece’ flow. Savings: 3.1 hours. This was by far the most beneficial improvement. One of the most fundamental lean concepts is that of ‘one-piece flow’ – instead of producing product in traditional “batches”, which leads to excess inventory and other wastes. Although I’ve championed the benefits of one-piece flow at work, there was a discontinuity to my application of it to my painting process at home. I would cut in all the trim first, then cover the larger sections all at once, essentially batching the work. Jess, I admonished. You can’t say one thing and do the opposite, even if you’re in a different setting. At least give it a try. What struck me was that even though I knew from experience that one-piece flow was a proven best practice, I was still resistant to giving it a try! This exemplified the disconnect between our intellectual knowledge and our willingness to apply that knowledge. It was fascinating to experience the internal resistance that I have observed from process owners when I initially encourage them to try one-piece flow. Finally, I reluctantly gave in. I started on a 4’x4′ section of the wall, cut in the trim, and then used the roller to finish it. At first it felt awkward to switch between tools. I mitigated some of this by using the roller tray to supply paint not only for the roller but the brush as well, eliminating the need for an additional smaller container. I set the painting ladder to my right. When I finished the lower 4’x4′ section, I would then move on to the higher 4’x4 section to my right. When done with that, I again moved the ladder to my right to clear the lower 4’x4′ section so I could paint it, while simultaneously setting up the ladder for the next higher 4’x4 section. In this manner, I went around the entire room. Instead of having to set up the ladder twice for each section (once to do the trim, and again to do the rolling), I only had to set up the ladder once. Although it was hard to quantify the impact of this improvement, the results spoke for themselves. It took me only 2 hours to complete the painting. Since the other improvements had saved a total of 2.9 hours from the original 8 hours, this means that one-piece flow was responsible for saving 3.1 hours – that’s 39% of the painting time! In total, some relatively simple process tweaks enabled me to get back 6 hours of my Saturday, keep $33 in my pocket, and reminded me that ‘kaizen’ isn’t just for work. Leaving Toyota was one of the most difficult and painful decisions I have ever made. Working there was a tremendous experience. I fit naturally into Toyota’s deep-seated culture of continuous improvement, and found my values to be in total alignment with the companies. The phrase, “Toyota builds people, not cars” was completely true. I was given challenge and opportunity, and I experienced rapid growth in my skills and experience. Within two years I had been promoted from specialist to assistant manager. The future was bright, and I envisioned proudly spending the rest of my career at Toyota. And then my life circumstances changed, as they often do. I found myself having to leave the company I had grown to love. Devastated, I grieved the loss for months even after I started a new job in full-time continuous improvement. It seemed I would never be as happy as I had been working for Toyota. Some people postulate that ‘everything happens for a reason’. I don’t know if I agree with that general principle, but I became increasingly aware of an unexpected silver lining forming around the cloud of my departure. It started with the stark realization of just how much I had taken for granted at Toyota. Following the ingrained principle of “go-and-see”, I asked the operator that I was working with where the work instructions for his process were located so I could review them to better my understanding. I looked at him, stunned. Standardized work was such an elemental part of the Toyota Culture, and it was almost unfathomable to me that a manufacturing process could exist without it. This was just the beginning of the culture shock I would experience. One day, I watched as a team member struggled with putting a label on a box. Instead of calling the line leader or stopping the line, she hurriedly tried to fix the problem and keep up with production. I could sense her fear as she worked with flurried motions to try to keep up, but it was not enough to keep the work upstream from accumulating at her process. Inevitably, the line jammed up and was forced to stop. At Toyota, the team member would have pulled the andon to summon the team leader at the first sign of distress. If the team leader could not fix it within the tact time, then production would completely stop so that intense problem-solving could commence. Furthermore, there was no shame associated with this process – it was not viewed negatively, but rather as an opportunity to improve. The most significant challenge I ran into was in engaging the workforce. Because daily kaizen was so integral to the culture at Toyota, I took for granted that everyone was at least willing to try to continuously improve. I soon ran into resistance and found myself in the surreal position of having to make the fundamental case for change. “What have I gotten myself into?” I wondered. This is not to criticize my new company by any means. We are early on on journey of continuous improvement – it was not reasonable to compare them to Toyota, who had the benefit of 60+ years of experience. I learned to accept where we were, while simultaneously not being satisfied with the status quo. It takes time to transform a culture, and fortunately, my company was willing to invest the time and effort in doing so. What Toyota gave me was the benefit of seeing what excellence looked like, and so I had a vision of where we could take my new company. Then there were my own gaps in knowledge and skill that soon became very apparent. My manager mentioned ‘SMED’ to me one day, and I asked her what that meant. “Oh.” I said, feeling odd for not knowing something I was obviously supposed to have known. It turns out the phenomenon is shared by other Toyota alumni. Many of us understand ‘lean’ manufacturing concepts, but have not heard of the industry terms assigned to them. Even value stream mapping was foreign to me, as was the concept of ‘kaizen events’. At Toyota, kaizen was just something that we did on a daily basis, not as a condensed 3-5 day event. However, I learned how kaizen events were sometimes a useful tool for both quick wins and to catalyze cultural changes. My first assigned event was (of course) a SMED setup reduction. I researched and asked other practitioners for advice. The event was a learning experience – I made some errors and learned from them. Now, serving as a facilitator for these events is one of the most gratifying and enjoyable aspects of my role. Each of my teams has helped me improve. I intensified my efforts to apply continuous improvement to myself. I deepened my knowledge of lean by reading, listening to podcasts (particularly Gemba Academy and KaiNexus), and obtaining advice from more experienced practitioners. I learned how to make the case for continuous improvement by asking people what their “pain points” in their processes were, and helping give them a vision of what True North might look like. I learned that to truly implement sustainable improvements, I had to actively engage the team in identifying and implementing their own solutions, even when I thought I had a better idea (and I was often proven wrong!) I stumbled a lot in the beginning, and still do, but eventually I began to transform into the kind of practitioner that my company needed at this phase of its journey. In one of my recent projects, there was a particular supervisor who was initially resistant to our efforts. He had a strong sense of ownership over his area, and he saw our involvement as an intrusion. He heavily micromanaged his process and had a hard time ceding control to his team. I assured him we were not there to ‘fix’ his process, but rather to partner with him and his team to take it to the next level. Through respect and thorough communication, I worked on gaining his trust. I recognized the leadership skills that were dormant in him, and coached him toward realizing his potential. Eventually, there were signs that he was becoming more supportive, and he even voluntarily signed up for a separate continuous improvement team. At the end of a 5S kaizen event on his production floor, the team scored a 14 out of a possible 25 points, which is a great score for just after the event. But the supervisor was not satisfied. “Tomorrow we’re going to work hard to get that score up,” he said. I saw the look in his eye. He was hungry for more. The feedback overwhelmed me. And it was then that I realized that I needed to leave Toyota to fully appreciate all that it had taught me – and most of all, “Respect for People.” Now, I am in the incredible position of being able to share what I have learned with others, and to invest in their journeys of development and improvement. I will always be incredibly grateful to Toyota for the investment that was made in me, and now I have the honor and opportunity to spread the message of continuous improvement far more broadly. Indeed, leaving Toyota was one of the best things that I have ever done. And so was joining my current company. Although we aren’t as far along on our continuous improvement journey, we have made incredible strides in the past couple of years. My mentors coached and trained me to help close the gaps in my knowledge and confidence and empowered me to make significant and sustainable improvements. My teammates believe in me, support me, and always have my back. The project teams that I have had have inspired me and helped me become a better practitioner and facilitator. And I have been rewarded with the opportunity to contribute to the development of others. I have found the silver lining, and I am convinced that leaving Toyota was one of the best decisions of my life.